Hello hello! 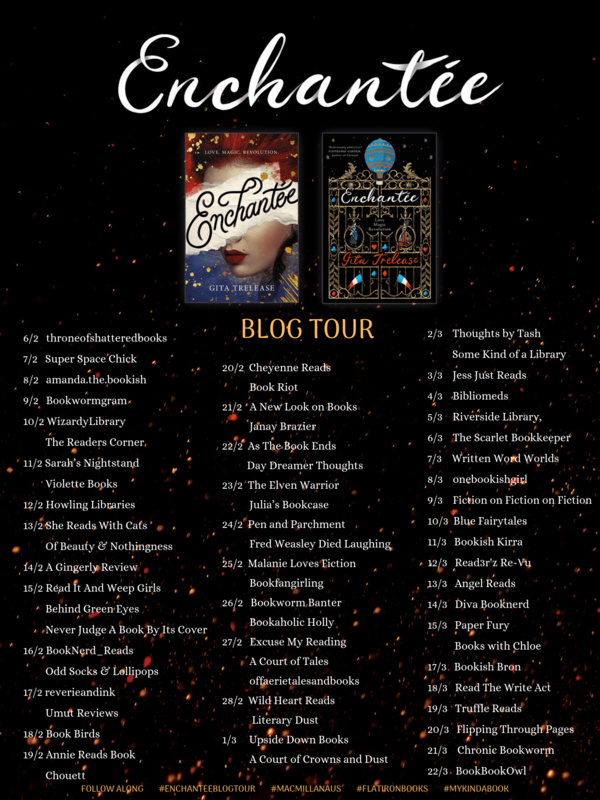 Today, I come bearing some super cool content as I had the opportunity to interview Gita Trelease, the lovely debut author of a YA historical fantasy book I recently read >> Enchantée (see my review for it here). If you haven’t already read my review, spoiler: I really liked this book, it was super enjoyable, so it made it even sweeter getting all my questions answered and – ma gosh, Gita’s answers were perfect and just left me wanting the sequel even more. 1. First of all, congratulations on the thrilling debut of your first novel! How does it feel to be a published author? Thank you! It feels wonderful, to be honest. I’ve dreamed of this since I was in high school—maybe even earlier. 2. Can you reveal how long you’ve been working on Enchantée for? And what are three things you’ve learnt during that time while writing it? 3. Paris and the French language obviously play a huge part/character in this novel. As someone natively fluent in French it was refreshing to see such an interesting combination of French used in the world building and dialogue of the book. Can you tell us when and how Paris & French inspired you? Any language learning tips for readers inspired to learn it themselves? I’m so glad you liked the French in the story! Since I’m not a native speaker nor was I ever fluent, I worry about getting it all correct. But I used it because I wanted to give readers of Enchantée as immersive an experience as I could. I studied French in high school, and then, after college, when I had no idea what to do with my life, a friend who was heading to Paris invited me to come along. We found a tiny apartment in the Marais, up seven flights of decrepit stairs—a very similar place to where I begin Camille’s story in Enchantée. Though I had a job teaching English to business people, I also spent a lot of time wandering the city, making friends, and staying out until dawn. It was a truly magical experience, and I fell deeply in love with Paris; Enchantée is a bit of a valentine to a city I adore. In terms of learning a language, there are lots of great apps to get people started but I really recommend a language class with a native speaker. When I studied Italian, I traded conversation (and corrections!) with an Italian who wanted to learn English. You do really need to be brave and not worry too much in the beginning. And the younger you are when you start, the better! 4. I personally love your magic system in Enchantée, what made you decide that sorrow should be the price or conduit for magic use? I’m drawn to magic systems in which there is a cost (Holly Black is a master of this) and I wanted very much to create one that would work with the setting in pre-revolutionary Paris. I wondered: what would this poor girl have such that she could pay the cost of working magic? The only thing she had, I realized, was her sorrow. I also like that she was able to take something many of us think is useless or want to forget and to use it to forge something valuable. It was only after the second or third draft that I remembered that in the Grimms’ Cinderella, Cinderella waters her mother’s grave with her tears and that it’s the tree—not a fairy godmother like in Perrault’s version—that gives her the dress she wears to the ball. To me, this felt like a sign that I was on the right track with the magic system. 5. Your main character, Camille, is such a strong and determined character; how much of yourself or someone else who inspired you, did you put into her? 6. It can be said that not many YA fantasy books are set in 18th Century Paris before the French Revolution, so what drew you to that historical period in particular? I find it a fascinating time. It’s a hinge or threshold moment when the glamorous but decadent world of the aristocrats is dying, and a new world, shaped by new ideas, is being born. And because of that, there’s a lot of turmoil and conflict, and I find that makes for a dramatic setting. The French Revolution was a time when France was, in a way, searching for its identity—what did the country and its people want to become?—and that reminded me of the search for identity I underwent myself when I was a teen. 7. For the aspiring fantasy authors out there, and even specifically, historical fantasy writers, what are your main planning & writing tips? Any secrets for incorporating fiction into fact? I find there’s a lot of variety in historical fantasy novels—some stick fairly closely to the historical record and some use the historical setting very loosely. I stayed close to the historical record in Enchantée, and I wanted the magic to feel as if it could have existed in that historical setting. For me, research is incredibly important—not just because I want the story to feel authentic and “correct” (though I do)—but because I never know what kind of detail will turn up in my reading that will be really important and inspiring. For example, I’d many times visited Versailles, which is gorgeously renovated, and was therefore surprised to read a letter from an English visitor in the 1780s who wrote that the palace was falling apart. He described it being filthy—courtiers and guests urinating in corners, dogs pooping everywhere—and necessary repairs to the buildings hadn’t been done in years. The image I had while reading that letter was of a palace crumbling and rotting, which in turn helped me imagine the specific transformative magic that occurs at Versailles, and that in turn suggested an entire magical history. I try hard not to let anachronistic details or even thoughts into the story—I don’t want one of my characters to describe the ice splitting open like a zipper, for example, if zippers haven’t been invented yet. This kind of immersion and restriction is necessary for my process—I’m a bit like a method actor in that way—though others may do it differently. Research and writing are interwoven for me, and the more I read about the time period, the more certain details start to feel fated. When Camille first goes to the Palais-Royal, she passes through a room where people are playing roulette. I wrote that in—the clicking of the wheel becomes a motif in the story—but then realized I had no idea if roulette had actually existed at that time! I was going to be incredibly disappointed if I had to take it out. But when I did the research, I discovered that it roulette been created just before the novel takes place, and one of the first places it was played was at the Palais-Royal. 8. Lastly, if you could be anyone, whether it was a real person or a character from Enchantée, in 18th Century Paris, who would you be and why? This is such a hard question, because even though Camille claims a lot of freedom for herself, women’s lives were quite restricted at the time. Most of the women in the book—Camille, Sophie, Aurélie, Marie Antoinette, the salon hostess Madame de Staël—weren’t often free to be or do what they wished. So if I had to choose to be someone else, it would be the aeronaut Lazare Mellais. Thank you so much to Gita and to Macmillan Australia for giving me the opportunity to conduct this author interview! I love doing these and Gita’s answers were so great. If you haven’t already checked out Enchantée at your local bookstore, library or ebook store, I highly recommend it. You can find my full spoiler-free review for the gorgeous book right >HERE< if you’d like to know what I thought about it. Want to see who else has been on the blog tour and what you might’ve missed this past month? What did you think of Enchantée and this author interview? Would you live in 18th Century Paris if you could?